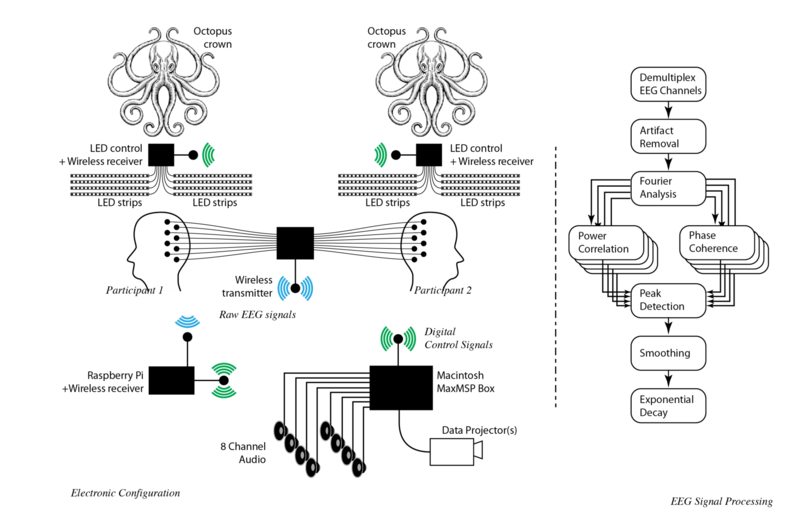 Octopus crowns are outfitted with EEG recording devices. Electrodes are placed on the heads of the two active participants in Octopus Brainstorming: Empathy to record tiny signals (from 1 to about 100 µVolts). 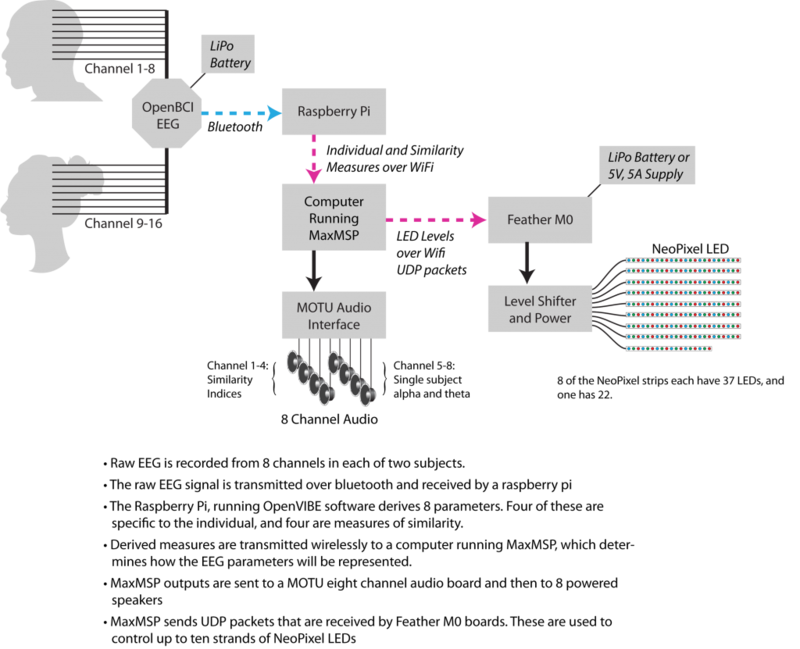 These are transmitted wirelessly to computers that first filter out various electrical artifacts, then run the signals through a sliding window Fourier transform, measuring the signal energy at 60 different frequencies between 1 and 60 hertz. The signal strength in several crucial frequency bands: 8-14 Hertz (alpha) and 4-7 Hertz (theta) are further analyzed for their phase synchrony(transient phase locking). We use the signal amplitude covariance, and the spectrally-bound phase synchrony, as measures of signal similarity of the participants. In addition, we measure the band powers of the other EEG signals. A total of eight calculated parameters from the EEG are derived and passed to the display and acoustic environment. Each of the octopus crowns is illuminated by 350 LEDS whose colors are controlled by these calculations. Our collaboration is unusual, in that the project is heavily informed by modern neuroscience. Veracity is a huge component of the work, which strives for a non-metaphorical relationship of the brain science to the artistic expression. Because we will open-source the instrumentation and code, we hope to contribute to the artistic community by improving their access to quality implementations of the devices to use in their own future works. The software we are developing will be open source and available toother artists and technologists to use freely and, in the long run, my collaborator is interested to make a commercial EEG platform.